The American Otological Society, created in 1868, is dedicated to fostering a dialogue on and dissemination of, information pertaining to advances in evidence based diagnosis and management of otologic and neurotologic disorders. The focus on otologic and neurotologic disorders and scientific advances are translated to the provision of quality care that is consistent with the ACGME general competency areas and the Institute of Medicine competencies. The primary target audience for the educational efforts of the American Otological Society is the current and potential members of the society. These members are physicians, physicians-in-training, audiologists and researchers in the fields of otology and neurotology. Educational activities are also open to other healthcare professionals who are involved in the care of patients with otologic and neurotologic conditions. 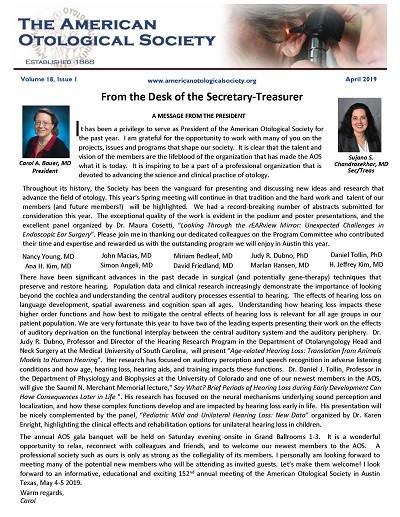 The primary activity of the American Otological Society is the Annual Meeting that focuses on the advancement of the scientific and clinical evidence that supports advances in otologic and neurotologic care to patients. Additionally, non certified educational support and resources include the publication and dissemination of peer reviewed and evidence-based content through Otology & Neurotology Journal and support for research in otology/neurotology and lateral skull base surgery and related disciplines. The content for the Annual Meeting and other related educational efforts are focused on otologic and neurotologic evidence based science, clinical standards of care, effects on communication, and other topics to the specialty. The expected results are focused on enhancing knowledge translation and promoting competence for the membership and other identified target audiences. The Annual Meeting, the CME certified annual activity of the society, and the other scholarly activities such as the publication of the Journal and support for research provide a rich and robust environment for self assessment and reflection, access to resources for lifelong learning and opportunities for discussion and re-evaluation. Whereas, the councils of the American Neurotology Society and American Otological Society desire to promote inclusivity within the membership of both organizations. Whereas it is recognized that diverse leadership and diversity of presenters allows for cross pollination of knowledge, perspective and experiences enabling a stronger and more robust educational experience for our members. Whereas the Councils of the organizations recognize the importance of acknowledging diversity among our patients, our trainees and our colleagues. Whereas, the purpose of the education programs of both organizations is to disseminate information designed to improve physician knowledge, patient care and outcomes, and advance the respective specialties. Whereas, valuable scientific contributions to Otology and Neurotology by colleagues (regardless of gender, race, or other attributes) should be presented at the society’s respective meetings. Be it resolved that the Scientific Program Committees of the American Neurotology Society and American Otological Society will select speakers and panel members endeavoring to balance educational goals while promoting the diversity of our respective Societies’ memberships and educational offerings. Be it resolved the Executive Councils of the ANS and AOS will select participation at all levels of the organizations endeavoring to reflect diversity of our respective Societies’ memberships.